The Vocal Microphone Accessory Bundle - Deluxe is a B&H Kit that features a Pearstone circular pop filter with gooseneck for vocal recording, be it with a condenser, ribbon, or even dynamic microphone. The extended package includes a microphone stand with boom, and an XLR microphone cable. 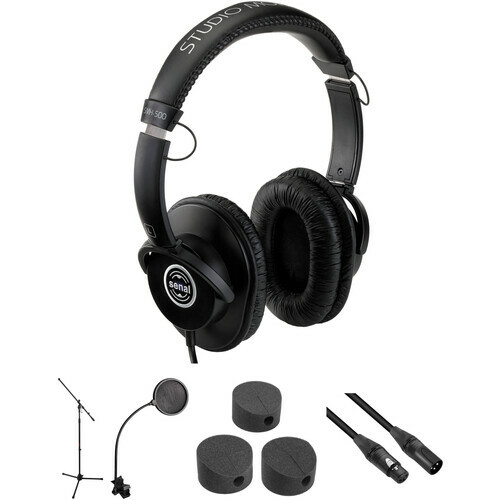 Additionally, a pair of headphones for the vocalist and a 3-pack of ISO-FEET microphone-stand isolation pads add functionality to this accessory bundle. The 3-pack of ISO-FEET Microphone-Stand Isolation Pads from Auray is a set of acoustic foam pads that are placed under the tripod legs of a microphone stand. They are used to prevent unwanted vibrations from traveling to the microphone, and help decouple the microphone stand from the floor, the desktop, or the stage in audio applications. Tapping feet, vibrations from amplifiers, drums, or accidental bumps are some of the scenarios that can affect your audio signal during performance. Adding the ISO-FEET to your microphone stand will help keep your audio signal clean, clear, and free of unwanted noise. The black Kopul Premium Performance 3000 Series XLR M to XLR F Microphone Cable (10') is designed to be an extremely quiet and flexible cable that is ideal for the most demanding live sound and performance applications. The cable is engineered to be durable and to provide protection against EMI, RFI, and static noise. While the cable's color-coding affords the ability to quickly differentiate between multiple connections on stage, it provides a pleasant aesthetic quality at the same time. Box Dimensions (LxWxH) 10.9 x 7.0 x 4.5"
Box Dimensions (LxWxH) 7.9 x 4.8 x 4.1"
Box Dimensions (LxWxH) 5.7 x 2.2 x 1.0"
Could this headphone be noise cancelling enough for airplane travel? The Senal SMH-500 in this kit will isolate sound, but they are not noise-cancelling. You could use the headphones for listening, but you will hear outside noise from the plane. A more appropriate suggestion would be the Sony MDR-ZX110NC Noise-Canceling Stereo Headphones, B&amp;H # SOMDRZX110NC.